As of Monday, 04/27/15, let me say this. We had five days of completely orderly demonstrations. Only after that did the interlopers arrive, and only after that did any trouble begin. I’ve just read this article, which indicates interlopers were indeed allowed to address the crowd at the original gathering Saturday 2015-04-25. They said things I do not believe any native Baltimorean would have said. They had to rationalize their presence, and in my judgment, failed. Ta-Nehisi Coates has had two “provocative” HuffPost columns in two days. 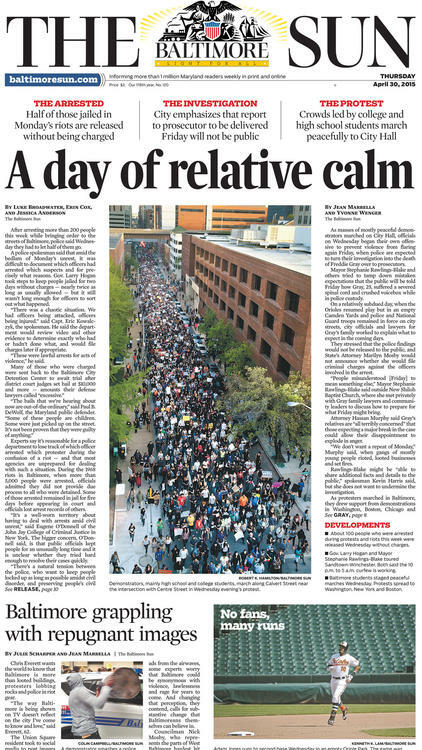 Wednesday she decried calls for calm in Baltimore. Yesterday she used the incident of Toya Graham’s confrontation of her son, to blame white people for every incident of violence among blacks. [P.S. 12:00. Correction: The latter was by Stacey Patton.] I may yet respond to the latter, but it’s best I not do so today. I need to direct my thoughts and choose my feelings, and I feel immeasurably better when I focus on my own affairs than when I allow myself to get engaged with her turmoil. Today’s task is to prepare materials for the prayer course; and it will be no excuse if I tell my students I came unprepared because she distracted me.